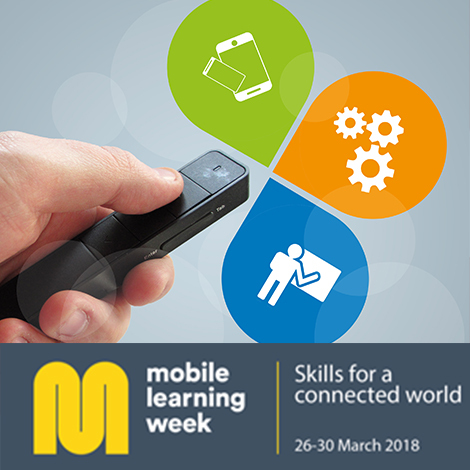 The UNESCO Mobile Learning Week kicks off on the 26th March 2018 at the UNESCO Headquarters in Paris. Focusing on the theme of ‘Skills for a connected world’, the event will take a multifaceted approach to mainstreaming digital skills, emerging skills requirements in the digital economy, amongst other themes. As part of this event, UNESCO-UNEVOC will be conducting a workshop to explore the nexus of skills, technology and pedagogy. UNESCO-UNEVOC’s workshop Boosting skills learning through mobile technology: The skills-pedagogy-technology nexus is based on the increasing importance of mobile technologies as a tool for teaching and training the workforce of the future. Mobile technologies can not only improve access to learning and educational materials, but also enhance the quality of learning outcomes for students and teachers, alike. UNESCO-UNEVOC’s work in ICT has engaged at length with the issue of greater integration of ICTs in instructional design and pedagogy as the most critical element in transforming TVET. However, there is a need for more evidence to show how teachers improve skills training and development with technologies. UNESCO-UNEVOC’s workshop will bring attention to the approaches and innovations in TVET-oriented practices that have adopted the use of mobile technology to improve the skills and content delivery by teachers and trainers. These initiatives will illustrate the synergy between mobile technology, teacher-trainers digital skills and pedagogy to be able to transform TVET teaching and learning environments. The workshop will not discuss how important mobile is in teaching and learning but rather concentrate on the need for technology and teacher-trainer preparedness on skills training and vocational education. The UNESCO-UNEVOC Promising Practices database presents inspiring initiative tackling key-themes in TVET, such as Gender equality, Youth employment, Greening, ICT in TVET and more. One such Promising Practice identified by UNESCO-UNEVOC is Laboratoria, Peru- a Lima-based web development company enabling women to learn coding and software development skills in Latin America since 2014. Catch Ms. Marianna Costa Checa – CEO & Co-Founder of Laboratoria, Peru at the MLW 2018 to know more about the Laboratoria story, or learn more about her views here. Mobile Learning Week is UNESCO’s flagship ICT in education event. The 2018 edition, under the theme “Skills for a connected world”, will examine the types of skills needed in and for a connected economy and society, with a focus on digital skills and competencies. It will also review strategies and ways in which these skills can be delivered and assessed within the context of Sustainable Development Goal 4 (SDG 4). Mobile Learning Week 2018 is being organized in partnership with the International Telecommunication Union (ITU), the United Nations specialized agency for ICT, which jointly established the Broadband Commission with UNESCO.